We once again pull back the curtain to let you, the news consumer, learn about another of the behind-the-scenes ways in which the news is made. In a time of increasing competition for news attention, some health/medical/science news purveyors break new ground of questionable ethical practice. In so doing, they may lure journalists into ethical missteps as well. Both parties should know better and abandon the practice we describe herein. Sounds helpful. But keep reading from the fellowship announcement. Each fellow will receive a stipend of $1,500, with $500 to be paid on arrival at the meeting and the remaining $1,000 upon publication/airing of the long-term project. In addition, GSA will arrange and pay for all flights and hotel bookings in Boston, Massachusetts. Qualifying local travel expenses (e.g., cab, train, or bus fares). I am going to an ocean meeting at the end of the month on a grant. But there is no requirement for stories. Some of the stories I find there might be bouncing around my noodle for months or more. I just sold a story from a meeting I attended a year ago. I just had to wait for the time to be right. I went to a meeting in Boston on brain science that was very important for my work but I haven’t sold a story from it yet. The troubling aspect of this is when they start demanding coverage. It’s incredibly hard for freelancers to avoid conflicts of interest and this basically just serves them on a plate. To GSA, I would say that I assume they set this up with the best of intentions. 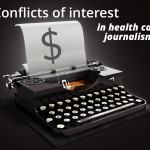 But by requiring coverage, they are eroding the foundations of good journalism and normalizing conflicts of interest. If they want good journalists to cover them, they have to respect good journalism practices. I don’t think I’ve ever seen anything like this arrangement. The GSA’s fellowship requirements are troubling. Basically, they seem to have created a really expensive PR campaign to produce vetted advertorials. I’m never really comfortable with these types of fellowships, but I don’t think they’re universally bad. This one crosses too many lines for me. It’s difficult to get around this description: We’ll pay you if you write about us. Preserve a dispassionate relationship with sources, avoiding conflicts of interest, real or perceived. Weigh the potential benefits involved in accepting fees, honoraria, free travel, paid expenses from organizers of conferences or events against the desire to preserve our credibility with the audience and the need to avoid even the appearance of a conflict of interest. What if a journalist applied for the fellowship, was accepted, attended the meeting, and didn’t find anything that he or she – exercising sound editorial judgment – thought was newsworthy? By the terms of the fellowship, they’d have to write something anyway. I emailed Todd Kluss, the program’s Co-Director and the Gerontological Society of America’s Associate Director of Communications requesting an interview about the program. He has not responded. News that concerns an aging population should stand on its own merits. The importance of such news should be clear to news organizations. 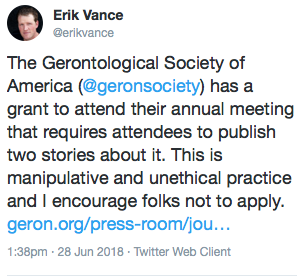 It shouldn’t require a kind of bribe to get journalists to attend a meeting about aging issues and then to report on issues that are discovered at the meeting. If that’s the depth to which meeting coverage has devolved, we are in worse straits in the polluted stream of health care news to the public than most people are aware. The application deadline is tomorrow, July 12. It’s not too late for GSA to abandon this offer, and not too late for journalists to back away from an ethical morass. 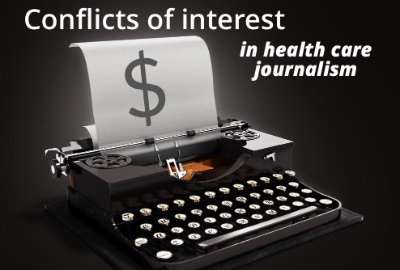 Other things that we have published about conflicts of interest in health care journalism appear on this page: The trail of tainted funding: Conflicts of interest in healthcare, academics, public relations and journalism. In response to our scrutiny, the GSA has changed the published requirements of the Aging Fellows Program as they appear on the program website. 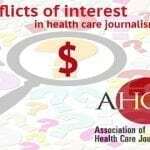 As a healthcare journalist practicing my craft for more than 25 years and a co-founder of the Association of Health Care Journalists (AHCJ), I guess I should have known better. About five years ago I heard about the Gerontological Society of America (which, by the way, is not a healthcare organization or a provider association, but a well-respected research group studying aging from a multi-disciplinary approach that spans health, biology and financing as well as lifestyle, employment and discrimination) some years back and learned from an AHCJ conference sponsor that GSA was offering fellowships to working journalists to make it possible to attend its annual scientific meetings. I applied for the Journalists in Aging Fellows Program and was accepted. No one at GSA or the Fellowship Program told me what to write about. No one demanded that I cover anything. No one at either organization told me I must write about GSA, let alone any flattering “advertorials’ to make the organization look good. Like most fellowship programs, attendees are asked to produce something. That doesn’t seem unfair. There is no such thing as free money. But there was no “hidden agenda” or officially approved topics. What we fellows wrote about was up to us. GSA and the fellowship program assisted us in completing our writing projects if we requested it. I found a wealth of topics among the hundreds of conference sessions offered. In addition, I met world renowned experts either presenting at or attending the conference. If I needed an introduction or contact information, Todd Kluss, GSA’s assistant communications director, or Paul Kleyman, a veteran journalist who co-directed the fellowship program from its inception, always offered to help. They did not demand we use ‘official’ sources or avoid any sources. In attending the GSA meetings and long after, Kluss and Kleyman proved to be invaluable resources to me and countless other journalists, including many local reporters who often attended when GSA’s scientific meetings were held in their hometowns, not just for GSA meetings, but any stories on aging. While journalists who were awarded fellowships attended the GSA Scientific Meeting, the fellowship program was run by journalists like Kleyman, who almost invented the aging beat decades ago. Other journalists presented at the fellows’ program, a daylong “Covering Aging 101” session that spanned Medicare, Social Security and a variety of other aging topics. They also served as mentors to younger journalists and fellows new to the beat. After attending my first GSA conference, I dove into the aging beat with greater authority and enthusiasm, finding a treasure trove of stories about our parents, grandparents and increasingly, my own generation. When I was a reporter with a Knight Ridder-owned paper and a legal affairs reporter with Crain’s “Modern Heathcare Magazine,” it was a different era. News organizations would support journalist travel to cover conferences. Today as a freelancer, many of us cannot afford such hefty expenses ourselves. This fellowship program not only fills a need, but serves the broader interests of healthcare journalists seeking to expand their knowledge relating to aging issues. GSA didn’t have to persuade or bribe me or the other journalists attending to write about the sessions. We knew good stories when we saw them. GSA and the fellowship program only made it financially possible for us to pursue those stories, which, I would argue, also serves our readers, listeners and viewers and informs them about these important topics. We didn’t sell our souls to anyone. In the eight years of the fellowship program I’ve never heard any journalists complain about being strong-armed. If this was a PR stunt, GSA and the fellowship program would demand prior review of stories. They don’t. To slam a program nearly sight unseen that more than 100 journalists have found useful based only on an application announcement without even interviewing Kluss or Kleyman seems not only unfair, but journalistically shoddy for such a thorough publication as “HealthNews Review.” To do it without contacting current or former fellows is imponderable. Unless you are aware of a pending scandal that required urgent publication, there was no compelling reason to publish without doing due diligence and contacting the appropriate sources, you know, Journalism 101. The three sources quoted in the blog were not affiliated with GSA or the fellowship program and none were identified as GSA journalism fellows. But they tossed the predictable ethical grenades anyway from the sidelines, far from any knowledge of the organizations, people or programs involved. Another source, Mr. Elliott, smugly asked: “Who needs a PR office when you can just pay journalists to write stories for you?” He could have found out what the fellowship ACTUALLY does before weighing in. Instead he, the other source, Mr. Vance, and “HealthNews Review” based an entire jeremiad on the online equivalent of a marketing flyer, an application announcement easily misread or misinterpreted. Perhaps it was poorly worded and inaccurate. Attack that. You’d be on more solid ground. But soliciting holier than thou observations from healthcare pundits without doing the work of reporting is not journalism, it’s a cable TV pile on. As someone who has twice mentored fellows through the program without compensation, I’ve met many GSA fellows and haven’t encountered one who didn’t find it a valuable and important experience. I never met anyone who felt bribed, coerced or persuaded to slant or soften a story. I recognize that I am speaking only from my experience, that there could be fellows who had a different, perhaps even unfavorable perspective. Seems like interviewing some of them would have given the piece a little more gravitas and a lot more authority. Instead HNR seems to portray GSA, a stodgy, academically oriented research organization comprised of scientists, gerontologists and senior social services professionals, as sinister Gucifer 2s plotting to lure unsuspecting journalists into writing puff pieces. When HNR allegedly “pulled back the curtain” in this blog entry, all readers found was a thinly supported attack on a really dedicated and committed training and educational organization genuinely trying to help journalists understand an important topic. What the fellowship program really is——pull back the curtains now—- is a platform offering journalists an opportunity to learn more about aging, a fellowship program that has operated for eight years without a hint of scandal and a program that many journalists have found helpful in their work. I’m not suggesting reporters shouldn’t carefully review and explore fellowships or grants before signing on. They should not leave their ethics at the door. But this blog post was unjustified and unfair. It maligns the integrity, not only of the sponsoring organizations, but of the journalists who have participated in the program. Thanks for your kind comments about our work and for recognizing the need for what we do. 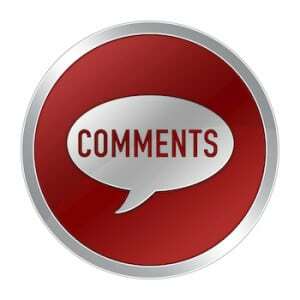 Gary Schwitzer is on vacation but let me respond to several misconceptions and misstatements expressed in your comment (which comes in at about 200 words longer than what you described as our “jeremiad” — just sayin’). First, you describe Gary’s post as a “thinly supported attack” that erroneously focuses on what might be an “inaccurate and poorly worded” marketing flyer. But you seem to concede that the central premise of the post is correct — which is that there is “no such thing as free money” and that the GSA expects coverage in exchange for footing the bill for fellowship participants to attend the meeting. That’s what Gary and our other sources objected to and you’ve confirmed that the program operates as described. You go on to state that GSA doesn’t demand that certain topics be covered or that certain sources be used, as if that refutes what we wrote. But the post made no claims about coercion or the strong-arm tactics that you reference. The post objected very specifically to the requirement that fellowship participants cover the meeting — which makes this a strings-attached offer that undermines journalism ethics standards as explained very clearly in the post. You state that it was “journalistically shoddy” for us to criticize the program without interviewing the directors. But in fact, as stated clearly in the post, Gary reached out to Todd Kluss before publishing and gave him plenty of time for a response. We heard nothing. In fact, to this day we’ve heard nothing from the program as far as I’m aware, which certainly seems odd if the piece is as inaccurate as you claim. At the least you’d think they would contact us to correct the marketing announcement which may or may not mischaracterize the nature of the quid pro quo. Lastly, you cite your own experience and that of other journalists whom you say have found the program worthwhile — again as if this negates the problematic aspects that we’ve called attention to. But this is a blinkered view. It stands to reason that journalists who’ve accepted this deal and had their expenses paid to attend the meeting would tend to view the program favorably. And that’s not to say that program doesn’t offer the benefits that you’ve described and operate generally in a capacity that is supportive of good journalism. But what about those who, on principle, said that they’d rather not compromise their ethics and accept this deal? You don’t seem to accept those voices as valid or important. In fact, you demeaned them as throwing “predictable ethical grenades” from the sidelines, when to my view they’re trying to stand up for journalistic integrity and doing things the right way. It’s precisely because of the media environment that we find ourselves in today, and which you acknowledge as a huge problem, that these voices are more important than ever. Trust matters, and I think we should embrace rather than attack those who demand that we uphold it as a profession. If the program is as hands-off as you say, why not simply abandon the requirement that journalists cover the meeting? That would send a very clear statement about the intent of the program and the GSA’s support of journalistic integrity. Mr. Lomangino, for the record, my co-director, Mr. Todd Kluss of the Gerontological Society of America (GSA) and I did send a direct reply to Mr. Gary Schwitzer on July 24, Evidently, he didn’t share that with his staff. On the Sunday Mr. Schwitzer e-mail Mr. Kluss requesting an interview, he’d likely have received the same vacation auto-reply that I did from him that day. I am Paul Kleyman, National Coordinator of the Journalists Network on Generations (JNG), which I co-founded 25 years ago, and editor of GBONews.org (Generations Beat Online News). I also co-created the Journalist in Aging Fellows program as one of a number of stipended and expenses-paid reporting fellowship I managed on staff at Pacific News Service’s New America Media, the news service for ethnic news media that unfortunately closed its doors last year. I, however, as head of JNG, continue to oversee the journalistic concerns for the fellowship program. GSA, which Mr. Schwitzer misidentified as a “health care organization,” is precisely the kind of multidisciplinary academic research society that should set the standard for a legitimate and fully ethical partner for journalists. Had Mr. Schwitzer done the basic reporting necessary to publish an accurate and fair account before rushing to publish his erroneous and unverified allegations, we may well have engaged in a constructive discussion about how best, and most ethically, to help reporters cover orphan newsbeats, such as aging, or to get minority perspectives into American media. 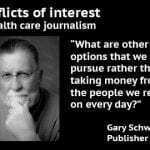 To stand in defense of ethnical journalism, though, even a well-respected figure in health care journalism needs to mind his own ethics, as do his sources, and ask questions before publishing their basis as unfounded and deeply unethical accusations. Mr. Schwitzer failed to verify his suppositions based on a selective reading of our application guideline. He neither made a good-faith effort to contract us before rushing to publish, nor do even the fundamental reporting I was taught over 50 years ago by such stalwarts as Prof. Mitchell Charnley, author of “Reporting,” at the University of Minnesota School of Journalism. Thanks for your reply. I can’t speak to all of the specifics of your exchange with Gary, who is currently off the grid on vacation, but I’d hardly characterize his approach as a “rush to publish” when it took GSA more than two weeks to respond to his request for a comment. Based on my correspondence with Gary, he indicated that Kluss’s vacation responder said he’d be back in the office on Monday July 9. That leaves at least two working days for him or someone else from GSA to respond. I’m sorry if you feel that two working days isn’t enough time for a communications person to respond to a request from a journalist, but I’d say that’s well within the accepted norms of the industry. How long would Gary have had to wait in order to meet your “good faith” standard? This is journalism after all, and while it’s unfortunate that GSA apparently feels that it didn’t have an opportunity to respond, I don’t think the fault for that lies with Gary Schwitzer or HealthNewsReview.org. As for “failing to verify his suppositions,” I think it’s pretty clear what the fellowship program materials say is required of program participants. If fellows are not required to “complete one short-term story about any aspect of the meeting” as the announcement states, then GSA should correct its erroneous materials and state clearly what the requirements are — rather than complain that we’ve misinterpreted what seems to be a straightforward deal. There is no such requirement in any fellowship contract. Your initial premise is wrong and I haven’t “confirmed” that the program operates as described because it doesn’t. And “HNR” would have known that if it actually spoke with someone who knew about it, rather than bringing in other journalists to insult the GSA, the program and past fellows. The “sources” in the story may have been “experts” on journalistic ethics, but their remarks do not apply to this fellowship program. They described the program aims as PR pieces, favorable coverage and advertorials, pejorative, inflammatory terms that are unsubstantiated. In general, I do agree with the blog’s premise that organizations should not expect to steer coverage by offering fellowships or grants for journalists to attend their conferences. But this blog post was not about “fellowship programs” in general. If it had been I never would have commented. No, this was an attack focused on a specific fellowship program that the sources knew nothing about, but were still willing to disparage. The ‘coverage’ that you describe assumes stories favorable to GSA or the fellowship program. No ‘coverage’ was requested. GSA does not require coverage of its meetings. Reporters didn’t have to cite GSA in their stories. Didn’t have to write PR pieces. Didn’t have to list the time and place of the meeting and describe the quality of the food served or the whizbang speakers. Fellows attended the sessions of their choice. I attended many, but I know some reporters who only attended a handful. No one was taking attendance. The blog post implied that there was something underhanded and deceptive about the sponsors, the program and anyone who would stoop so low as to apply. If that was not the intent of the piece, why were such loaded quotes included from people who knew nothing about the program? Of course I respect people “who’d rather not compromise their ethics and accept this deal,” as you described. I never had to “compromise my ethics” in this program. You suggest the program should “abandon the requirement that journalists cover the meeting.” Again, I repeat. There is nothing in the contract requiring journalism fellows to cover the meeting. I checked with Mr. Kluss about the timing of Mr. Schwitzer’s e mail contact on Sunday, July 8. Mr. Kluss’s “Out of Office reply” told the author that he was on vacation, but his reply offered contact information to reach Paul Kleyman, a journalist and the program’s co-director. Kleyman said he was never contacted by Schwitzer. The blog was posted July 11, essentially two working days. That’s not exactly “plenty of time for a response” from someone on vacation for a blog post that was not exactly breaking news. One phone call or e mail to a single source should not have been the only reporting done to arrive at the erroneous and unfair conclusion the blog reached. Seems like that’s something to which “HNR” should support. Please see my response to Paul Kleyman regarding timing. Two days back in the office seems like it ought to be plenty of time for a communications director to respond to a request from a journalist. As for the “errors” that have been repeatedly cited without substantiation, the fellowship program announcement clearly stated that fellows will “complete one short-term story about any aspect of the meeting.” You can interpret that however you like, but I think any reasonable journalist would take that to mean they have to write about the meeting. I received this fellowship last year and was happy for the opportunity. I felt I needed a reboot after caring for my mom for so many years. I had written a few EOL/aging stories when my mom was alive, but the opportunity to attend the GSA conference helped me get up-to-date on certain issues, and gave me some terrific sources. I was never asked to cover the conference. In fact, I rarely write news stories. My main feature from the fellowship doesn’t mention GSA and wasn’t reported from the conference.